Foooit™ Air Duster, Flammable 10 oz. removes dust, dirt and microscopic debris from hard to reach areas of home and office equipment. It’s ozone safe. Foooit recommend for: Computers • Keyboards • Sewing Machines • Photo Equipment • Cash Registers • Printers • Fax Machines • Copiers • Telephones • Lab Equipment • TVs • VCRs • Typewriters • Vacuums • Scanners • Stereos • Watches • Clocks • Mailing Machines • Fans • Audio Equipment • Electric Razors • Sports Equipment • Musical Instruments • Guns • Desk Tops and many more. Remove Dust from your Monitors, Central Processing Unit, Power Supplies and all other hard to reach areas. Remove Dust from your Camera & Lenses and all other hard to reach areas. 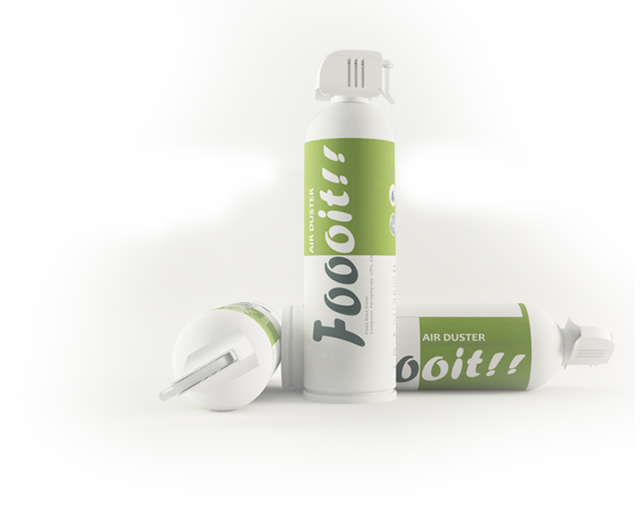 Try Foooit™ to remove dust from hard to reach areas in your Vehicle. Ever wondered how you remove dust from in-between your Air Conditioner vents? Well about time you give Foooit™ a try. Thanks for the super-fastest delivery and for this awesome product. Excellent value for money, and great product. Hard to find anywhere else. this was the I think 6th time I ordered from here. as usuall fully satisfied. Received on 3rd day, i forgot to confirm in time though. Excellent Seller! Wow!! Amazed at the fast shipping + professional packing! Definitely Recomended! Item as described. Good packing. Fast Shipping. Great Seller. Great Product, Prompt Shipping – Great Seller! Fantastic product and seller. Very quick and reliable. Fast delivery and just what I needed. Thank you. Don’t just move dust… Foooit!!! Keep all your electronic devices dirt-free with Foooit™ cleaning aide that aids in cleaning and removing dust from electronic items, appliances as well as other surfaces where cleaning with normal techniques fail. You don’t have to apply extra effort while cleaning with this Air Duster Spray. The product is exceptionally good as it cleans precisely not only your PCs and laptop, but also your back-end server systems, or other systems in your company’s IT room or server area. Foooit™ Air Duster, should be kept away from the reach of the children. It is environment-friendly, Ozone safe, and 10 oz canned bottle that is highly effective in removing dirt, hard dust and microscopic debris from several parts of home as well as the office equipment. Foooit™ Air Duster is highly recommended for cleaning a collection of electronic items and other appliances, articles, tools and tough surfaces that are otherwise not easily accessible or areas that are easily prone to dust and calls for a cleaning agent apart from other sub-standard brands and products in the market, that “actually” works and is “highly” effective than others. The can or bottle’s thin tube can attack the not so easily approachable holes or areas and “FOOO” away the dust and dirt particles residing there. © Copyright 2014-2016 Airduster All Rights Reserved.